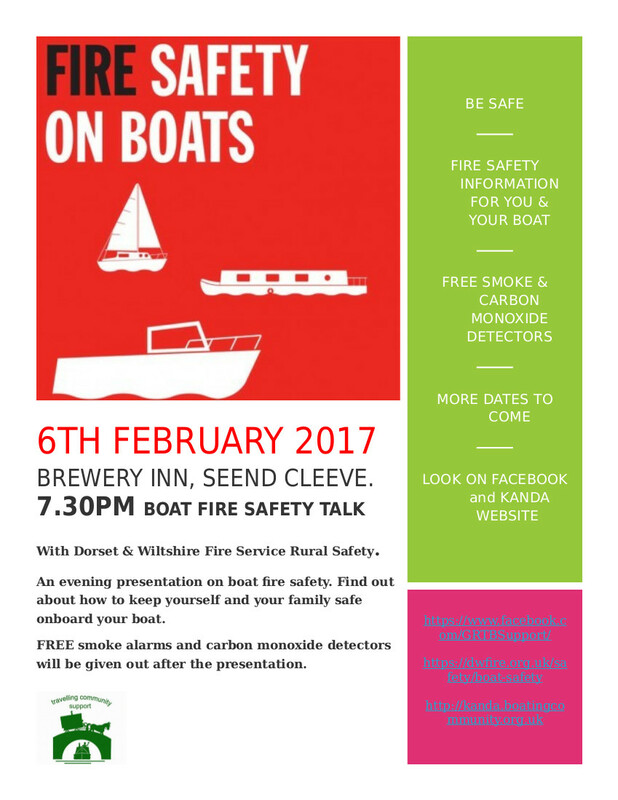 There will be a Boat Fire Safety talk by Dorset and Wiltshire Fire and Rescue Service at 7.30pm on Monday 6th February 2017 at the Brewery Inn, 69 Seend Cleeve, SN12 6PX. A massive 28% of boat fires cause fatalities. Don’t let this happen to you!! Come and find out how to prevent fire hazards on your boat. There will be FREE smoke and carbon monoxide alarms, and firefighters will be giving advice on how to minimise fire and carbon monoxide risks from solid fuel stoves, generators, engines, fuel and electrics. There will be a series of boat fire safety talks this winter in canalside pubs along the K&A, organised by Julian House Travelling Communities Support Service in conjunction with the fire service. If you can’t make it to Seend, the next one will be at the Waterfront in Pewsey on 14th March. There will be a Boat Fire Safety talk by Dorset and Wiltshire Fire and Rescue Service at 7.30pm on Monday 9th January 2017 at the Black Horse, Bath Rd, Devizes SN10 2AU, followed by the K&A boaters action group meeting. You are currently browsing the Kennet and Avon Boating Community Website archives for January 2017.